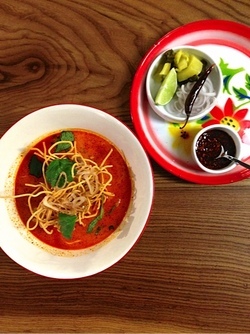 Khao soi. Photo courtesy of Pim Techamuanvivit. A couple of weeks ago, we had an update and sneak peek for you on the design details of the upcoming ~KIN KHAO~ in the Parc 55. Well, it’s looking like the space will be opening to the public for lunch this Friday February 21st. Owner Pim Techamuanvivit and chef de cuisine Michael Gaines have been hard at work, and soon everyone can say, “kin khao!” (“Kin” means eat and “khao” means rice, so it’s what you say in Thai to mean “let’s eat” or “to eat.”) The website has the menu and other details; the wine list and cocktail menu by the Bon Vivants are forthcoming. Dinner nightly 5:30pm-11pm, and lunch will be served 11am-3:30pm. The bar will open at 5pm for cocktails; a few weeks after the opening, you’ll be able to enjoy some bar bites with your cocktail until 2am.